The Trinamul Congress today held rallies and meeting across the hills to "thank" the people for purportedly rejecting the bandh called by Gorkha Janmukti Morcha yesterday. The thanksgiving rallies and public meetings by Trinamul suggest that Mamata Banerjee's party wants to sustain pressure on the Morcha which claims the shutdown was a success. Today, Trinamul held marches and meetings in Darjeeling, Kurseong and Mirik. 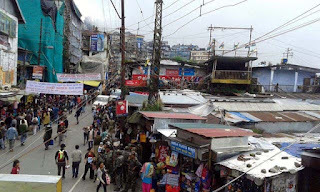 The ruling party did not hold any such programmes in Kalimpong and only thanked the residents over the public address system. In Darjeeling and Kurseong, the processions were led by ministers James Kujur and Rabindranath Ghosh, respectively. The march in Mirik was led by Bishnu Golay, the president of the hill unit of Trinamul's youth wing. In Darjeeling, Kujur said: "The chief minister wants development and loves Darjeeling. She has taken a number of initiatives for the welfare of Darjeeling people, like forming tea directorate. We are confident that Darjeeling also loves the chief minister." N.B. Khawash, the spokesman for Trinamul (hill), said: "Attendance in government offices was 97 per cent yesterday. Wives and relatives of many Morcha leaders also attended government offices (yesterday) and this shows that the opposition to the Morcha has started from its leaders' homes. We want to thank the relatives of Morcha leaders who attended office." The state administration had threatened to take action against employees who did not attend office yesterday. Many believe the government directive was responsible for good attendance in government offices on a bandh day. In the past three days, Trinamul held three successive rallies across the hills. "The festive season is about to start. However, we are planning two more political activities in the hills. The dates and venues have not been finalised," said Binny Sharma, the spokesman for Trinamul (hill). Asked about their success claim, Sharma said: "People did not support the bandh. We could be their voice. Shops opened, educational institutions were kept open and this is the first time that the Morcha has had to face such a situation in the past nine-and-a-half months." In fact, Mamata Banerjee, during her visit to Kalimpong last week, had also made it clear that she would not lose hope till the end. "We did not win the Parliament elections from here. We did not win the Assembly elections. But I have not stopped coming to the hills. I will continue to come and I am confident that you will start embracing development," Mamata had said in her public address in Kalimpong.